Effective 1 October 1895, seven naval war ships in the Far East were fitted on a trial basis with naval postal facilities. Crew mail had heretofore been collected and sent in large linen bags to the so-called “Imperial Palace Post Office” in Berlin, location of the Naval Postal Bureau, where mail was subsequently franked and entered the German postal system. Upon establishment of the Naval Post Office in summer 1897 along with shipping of mail in sealed mail bags, expensive shipping of mail to the Imperial Palace Post Office was no longer necessary. Mail was henceforth packed in mail bags and sent through the international mail stream to the Naval Postal Bureau from where it then entered the domestic mail stream and sent to the recipients. In view of the fact that Imperial Germany prior to World War I had over 2000 naval personnel on overseas duty, the mail volume was enormous. 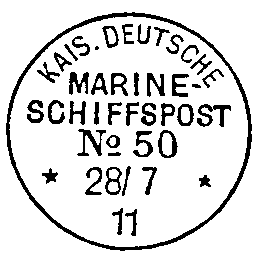 Postmark Numbers 1 to 86 were in use by the naval war & transport ships. Of those numbers, a large number were in use by those naval ship postal facilities in waters of the German colonies and offices abroad. 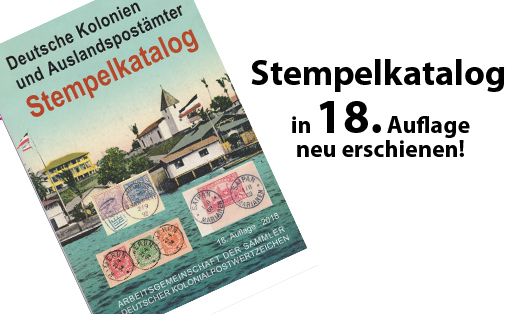 Ship postal facilities had supplies of the then current German postage stamps. Postage rates for letters & postcards were those of the colonial mail rates, effective 1899. 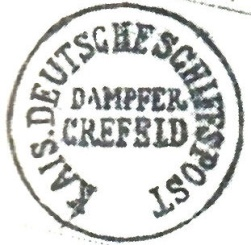 Stamps of the German Offices & Colonies were tolerated for use. Postal money transfers were already possible in the early 1890s. 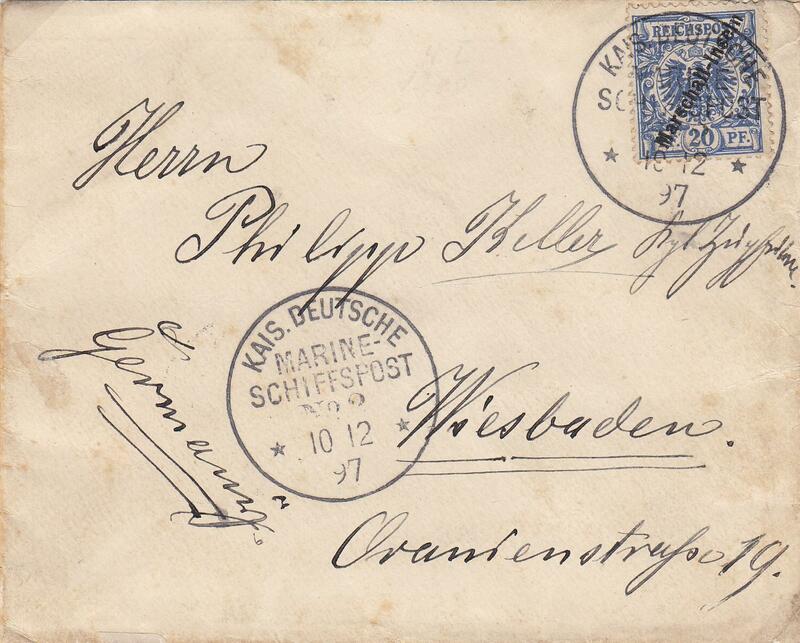 Sending registered mail was possible from onboard from 1903, but where such had to be routed to and processed at the Imperial Palace Post Office in Berlin. 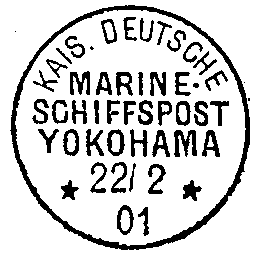 For mail sent from one seaman to another, or mail sent from one ship command to another, the postal procedure by way of the Naval Post Office n Berlin was not advantageous. For such reason every potential routing possibility was used to ship mail bags to the recipients’ post offices. Mail is known to have been handled at the UPU domestic-mail rates. Of particular interest with the collecting community is mail which originated during various naval campaign voyages. The following postal history reflects a small sampling of the breath of this collecting area. Included is naval mail, which directly relates to the naval ship post offices and which enriches a collection of naval ship mail. 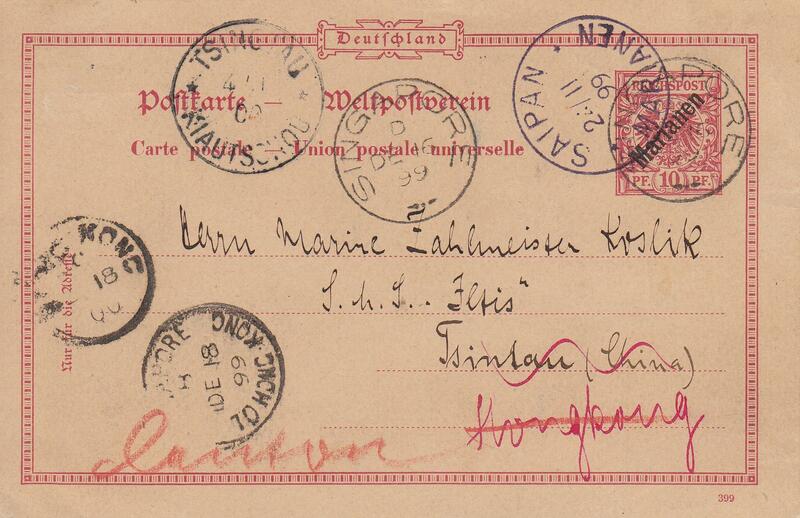 Postal stationery card of the German Offices in China having a “Naval Post Office 4” Postmark. This card was written aboard “SMS Irene” during the Manila Conflict. Officer’s cover, dated 10 December 1897, having 20 Pfg postage of the Marshall Islands, which was written aboard “SMS Bussard” while in waters at Jaluit (Marshall Islands). Newspaper wrapper with enclosure from Tsingtau and sent to a lieutenant at the Yokohama (German) Naval Hospital. Since the recipient was no longer in Japan, the wrapper was re-directed back to Tsingtau. 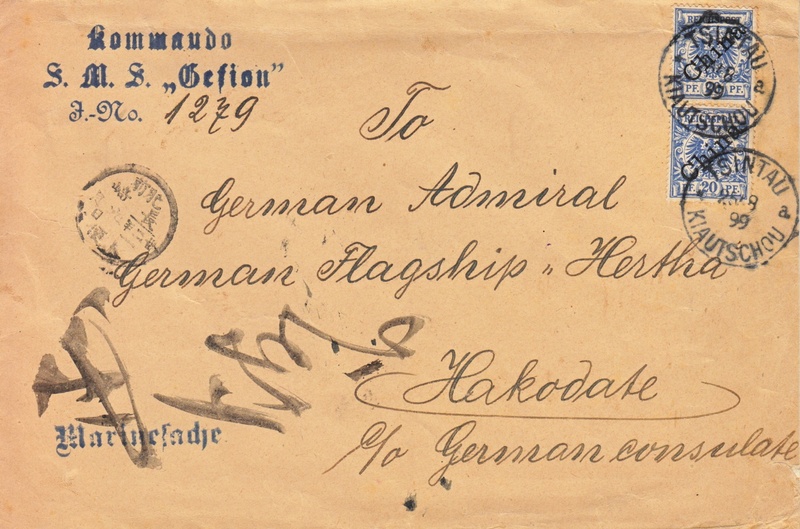 Official mail sent from “SMS Gefion”, a light cruiser, at Tsingtau to an admiral aboard “SMS Hertha” at Hakodate, Japan. 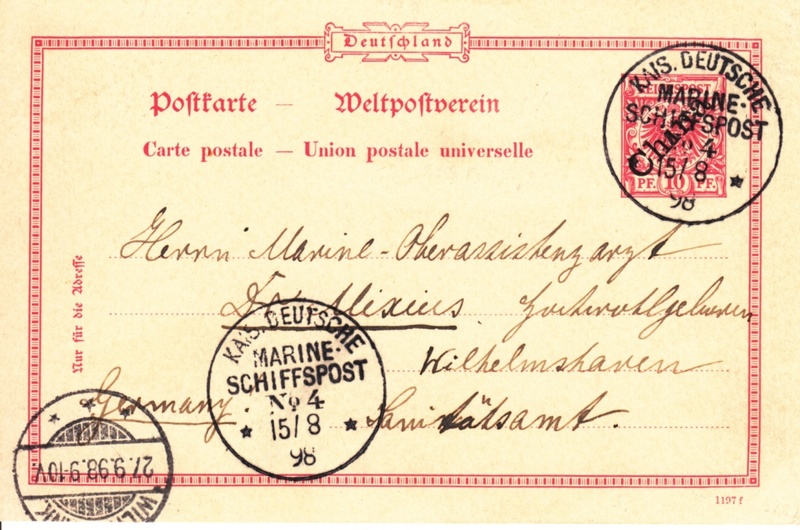 Despatches, official mail or private mail was always addressed to the Imperial German Consulate, since such were generally picked-up by ship personnel soon after arrival of the ship at a port. Postal stationery card postmark on the first day of mail sent from Saipan, Mariana Islands, and sent by a seaman aboard “SMS Jaguar” to the Paymaster aboard “SMS Illtis” at Tsingtau. This card was forwarded via Singapore, Tsingtau, Hong Kong and Canton. 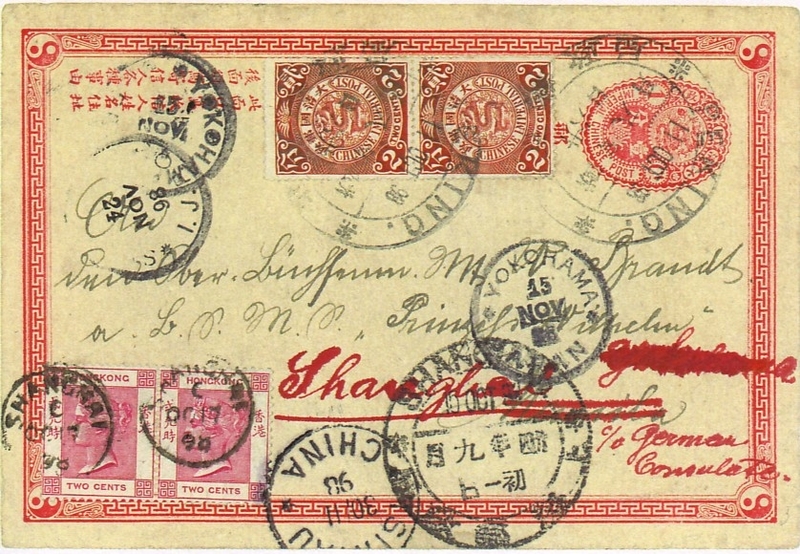 Postal stationery card of the Chinese Post Office, postmarked at Peking, sent to Shanghai and re-directed to Yokohama and Tsingtau for a recipient aboard “SMS Princeß Wilhelm”, a light cruiser.